Learning how to make a paper bag scrapbook album is very simple. These small scrapbook albums allow anyone to create a quick album for a particular theme. What Is a Paper Bag Scrapbook Album? This type of scrapbook album uses folded brown paper bags to form the pages. Paper bag scrapbooks are ideal for mini-albums, brag books or homemade books for kids. The paper bag base makes this scrapbook album more affordable than traditional scrapbooks. Paper bag albums aren't acid-free, so choose your photos carefully. It's best to use high-quality color photocopies or duplicate photos in these albums. Paper bags of any size: You'll need at least 2 bags, but you can use more to have more pages in the scrapbook. Each bag creates 4 pages because you will fold it in half. Fold each bag in half individually for the easiest folding. Stack the folded bags inside of one another. Alternate the open ends of the bag as you stack them. Punch holes along both sides of the fold. Make sure the holes align exactly to make the binding work. Bind the pages using eyelets, rivets, ribbon or book rings. Another option is to sew the binding to hold the bags together. You can use a sewing machine to sew the binding. As with a regular scrapbook, your creativity is the only limit for the embellishments on the paper bag scrapbook. Use the open end of the bags as a pocket to store tags or other items. You can cut a piece of cardstock to fit into the pouch for additional scrapbooking area. Glue a ribbon to the cardstock so you can easily pull it out to see the additional scrapbooking. The folded end of the bag offers a few different options. You can cut off the flap to create more pockets just like the open ends. If you leave the flaps on the bags, they make a decorative accent to the scrapbook pages. Decorate the flaps with tags or decorative papers. Underneath you can add additional journaling or small photos. The remainder of the scrapbook decoration is similar to any scrapbook. Use decorative papers, stickers and other embellishments along with your photos and journaling to create the keepsake scrapbook. 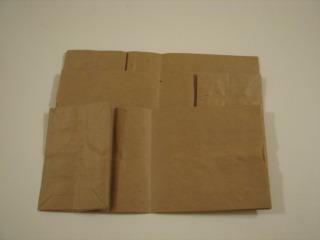 Craft stores often sell paper bags in various colors. Using the colored bags adds interest to the pages and helps set the tone. For example, a Fourth of July paper bag scrapbook looks festive with alternating red, white and blue paper bags. If you prefer a larger album, use the bigger paper bags. You can make a template for your holes to make sure each bag is hole punched exactly the same. Paper bag scrapbooks are perfect for kids. They can create their own scrapbooks using any theme with little assistance. Knowing how to make a paper bag scrapbook album opens up new scrapbooking possibilities using simple materials. Whether you use the paper bag scrapbook as a gift or keep it for yourself, the book comes together quickly but still allows plenty of customization.